Yesterday I went shopping at a local health food store. It is in the same location as the former ‘Inner Bookshop’. I loved that shop because I bought many spiritual books there. A health food store is a poor comparison. But I still like to support a few local independent stores – I do enough buying from Amazon and Tesco. Anyway, by the time I’m getting to the back of the shop, my inner Yorkshireman is coming to the fore. After spending £6 for a few seeds, I’m looking for a bargain to square the money circle. I see my favourite soup is on special offer £3.39 cut in price to for £2.50 – because it is getting close to its sell-by date. So I take one of these – I can eat it for lunch. 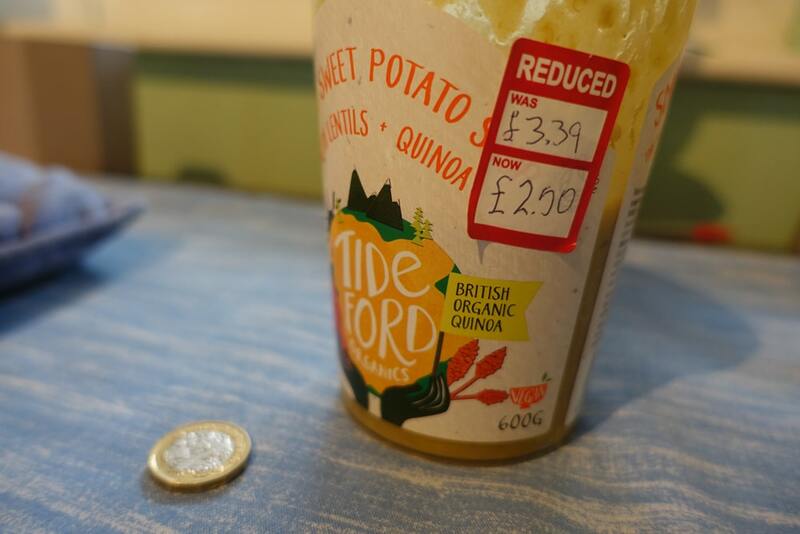 I also buy some avocado humous – reduced in price. So I take my shopping to till, and the lady rings in the products. First up is the soup and it goes through as £3.50 on the till. So I speak up and say – ‘the soup is on special offer’ She replies ‘Yes. That’s OK.’ So I assume she will sort it out, but I don’t see any correction on till. Anyway, at the end, I want to check the receipt. But, the shop doesn’t give out receipts. So here the very bad English reserve in me doesn’t want to make a scene and ask for a receipt so I can check up on the shop assistant. So I leave thinking if you can spend £6.25 on some paleo cereal, you shouldn’t worry about the chance of being overcharged £1. So I try to put it out of my mind. But, as I am cycling back home, can you believe what happens? I see a shiny one pound coin on the road! I pick up and offer thanks to Lakshmi. Often I pick up pennies out of respect for Lakshmi, but a Pound coin is more than worth picking up! So am I up £1 or am I down? I don’t feel bad spending £6.25 on a bit of sawdust and seeds, but I do feel a little bad for not chasing up the discount. Perhaps Lakshmi was trying to illumine me – just because you can afford to buy cereal for £6, doesn’t mean you shouldn’t give importance to the correct price – there is something more important than the actual money. But, look how Lakshmi illumined me – by allowing me to find a shiny one pound coin! So that was another shopping experience. Thank you, your shopping experiences are a delight to read.